The consumer financial advice and comparison shopping site NerdWallet on Friday published a lengthy feature on collision repairers’ complaints against auto insurers, another piece of coverage which brings the controversy to a larger audience. Like the “Anderson Cooper 360” piece, it focuses primarily on insurers’ reliance on recycled or aftermarket parts instead of OEM components and allegations that they steered customers to certain shops. NerdWallet, which says it receives more than 2 million unique visitors monthly, also cites Passwater and Consumer Reports for examples of how non-OEM parts can impact vehicle safety. 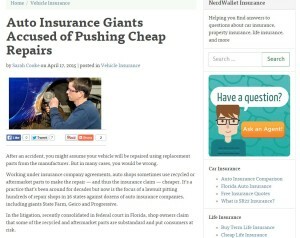 The website also for balance offered insurers’ arguments that they would financially lose by encouraging poor repairs and are trying to save customers premium money. As for steering, NerdWallet gives the example from A&E Body Shop et al v. 21st Century Centennial et al of Express Paint and Body, which left Geico’s direct repair program and and allegedly “immediately” was disparaged by Geico. Geico-related revenue dropped from more than $205,000 to less than $30,000 in a month, NerdWallet reported; the next year, Express only made $85,000. It concludes that such cases have gone to the legal system before, with both sides posting wins and losses, and also points out that similar allegations by auto shops led to the 1963 Consent Decree involving insurers.